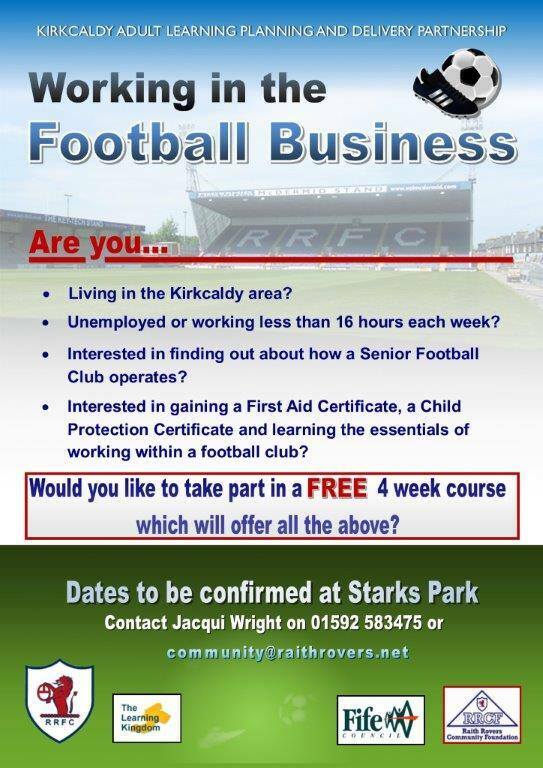 The Raith Rovers Community Foundation is working, in partnership with Fife Council (Community Learning and Development), to deliver an adult education course for unemployed adults which will be based at Stark’s Park. The course is “Working in the Football Business” and allows participants the chance to see the many different ways that people can be involved, and in some cases employed, within the football industry. Topics covered will range from football coaching to first aid and from refereeing to child well-being. The course is aimed at adults who are out of work or who work less than 16 hours per week and will run from 10am to 3pm on a Wednesday and Thursday for four weeks starting on 6th February. For more information, or to sign up to take part, call Jacqui at Fife Council’s Community Learning section on 01592 583475.